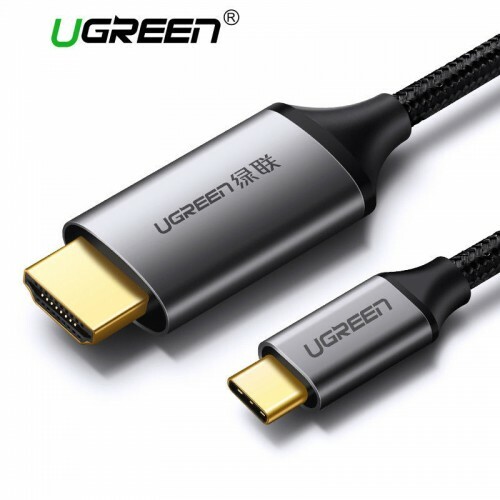 UGreen Type C to HDMI Cable 1.5M easily connect a USB-C enabled smartphone/computer/ Laptop to a HDTV, monitor or projector with HDMI port. 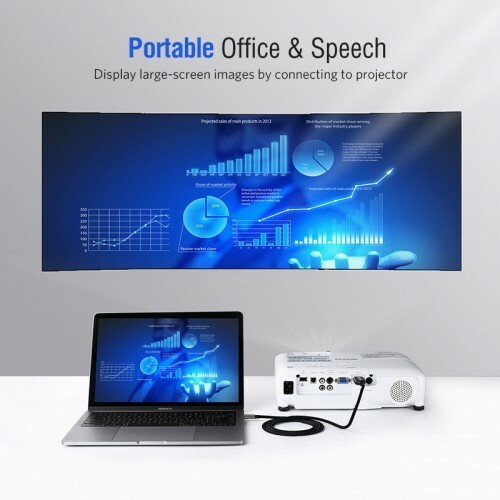 It is ideal for conference, presentation, gaming, or expanding work space by connecting your USB-C devices to a large screen.This cable Compatible with VESA DP1.2 and suppoer up to 5.4Gbps each channel; and also support 8-channel LPCM and compressed audio (AC-3, DTS) and HBR audio format and HDCP 1.4/2.2 .It built-in MCU and SPI ROM for low circuit design cost and convenient product firmware upgrade.This USB C HDMI Cable supports resolution up to 4K*2K(3840×2160) @30Hz for computers , displays, monitors and projectors. 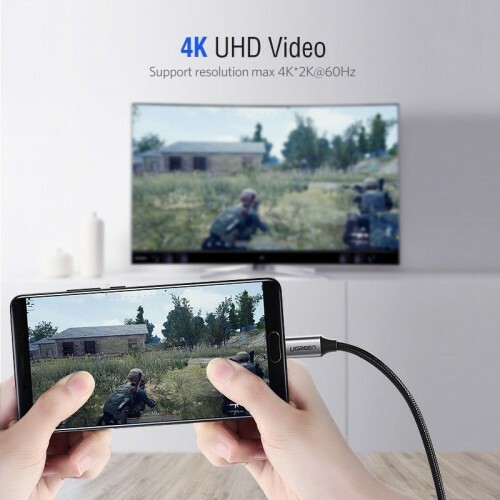 You can extend or mirror your USB-C laptop/smartphone to HDMI-enabled TV or display enjoying home theater.This HDMI cable used for Samsung Galaxy S9/S9 Plus/S8/S8 Plus/Note 8, iMac 2017 21.5\”/27\”, Macbook Pro 2017, Macbook 12\” 2015/2016, Macbook Pro 2016 13\”/15\”, Dell XPS 13(9350/9360), Lenovo Yoga 900/910, Huawei Matebook/Mate 10/Mate 9 Pro, LG V30/G5/V20, Chromebook Pixel, HTC One U11/10/One M9, ZenFone 3 Ultra, Alcatel Idol 4S, Liquid Jade Primo, Asus T303UA, Microsoft Lumia950, Dell ALIENWARE13 R2, HP EliteBook folio G1, ASUS ZenBook3 and more devices equipped with standard USB-C portA good solution to Extend your screen.It transmits high-definition video and audio simultaneously from any USB C-equipped to an advanced HDTV, monitor or projector that with HDMI interface.So it can easily extend phone or another small screen to a big screen, giving an unmatched visual experience. UHD 4K*2K Resolution. 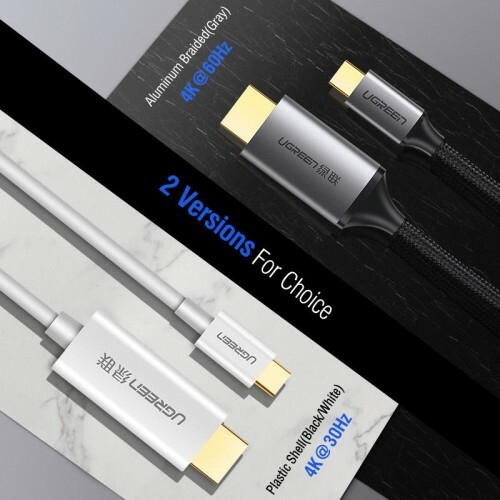 It designed with tinned copper and triple-layer shielding, the USB C to HDMI Cable is enough to transfer high-quality and stable video and audio signals, no worry about splash screen when you are watching a movie; The aluminum cover, nylon braided and gold-plated connectors all ensure the superior durability under the heavy usage and multiple plugging and unplugging. This product only works for devices with the USB C port which supports data and power in as well as video out(DP ALT MODE) functions.